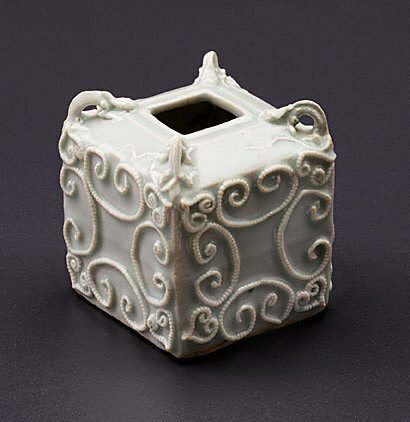 This small jar is modelled in the cuboid form with the shoulder rising to a square mouth. Each of the four vertical faces is decorated with applied beading and on the shoulder with modelled lugs in the form of 'chi' dragons. 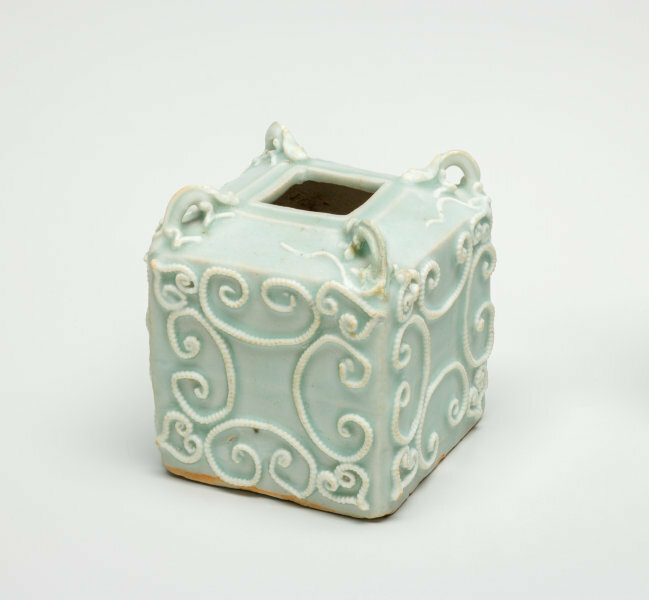 Over a porcelain body, the jar is covered with a 'qingbai' bluish-tone glaze. The flat base remains unglazed. The advent of the Yuan dynasty saw no marked disruption to the Southern Song tradition but did witness the introduction of new decorative techniques, both applied and painted. Moulded and modelled appliqué were used, with beading and studding as the two principal techniques. The elaboration of handle loops into serpentine 'chi' dragons was a particularly distinctive achievement of the Yuan potters, adding an exuberance and fanciful dimension to the otherwise restrained Song ceramic forms. Asian Art Department, AGNSW, June 1999. The Asian Collections Art Gallery of New South Wales , 'Export Ceramics', Sydney, 2003, 134 (colour illus. ).